I have a super exciting competition giveaway today! My very own 'Blogger's Choice' fat quarter bundle by Fat Quarter Shop! 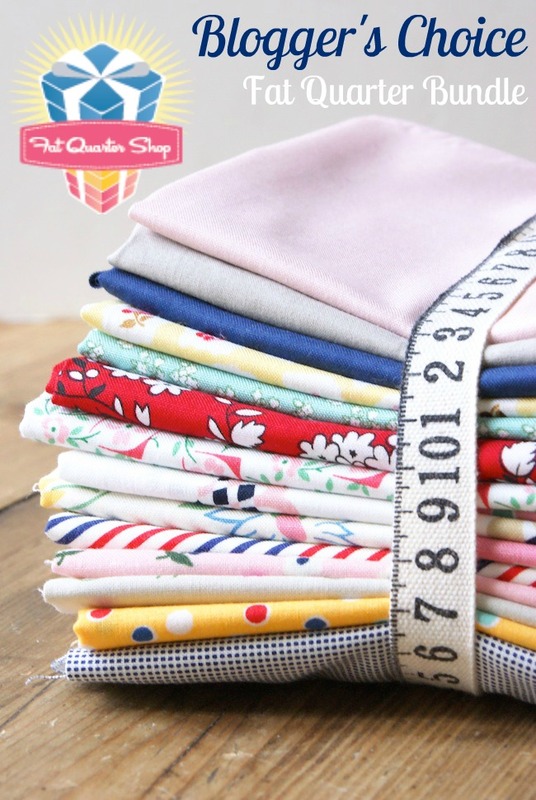 I have personally selected 15 fat quarters from Fat Quarter Shop's beautiful range of fabrics - from their new arrivals in February. I was lucky to get that month as their were SO many brilliant collections arriving! Florals and texts from Cotton and Steel lines, stripes and checks by American Jane's latest collection 'Fresh Air', and a few lovely 1930's repro's from Darlene Zimmerman, some delightful florals from the gorgeous 'Milk, Sugar & Flower' collection and rounding it out with some solids by American Made Brand. Perfect. I think the colour palette is just great, though I would say that as I'm a little biased ;-) So more importantly, what should I make with these pretties? I need something special. Any ideas? Leave a comment on this post telling me what you would like to make with them and follow my blog. For an extra entry, you can follow me on Instagram @messyjesse1 - leave another comment on this post to tell me. Competition closes Sunday 8th March I will then check through the results and announce the winner Monday - so be sure to subscribe and check back. Best of luck! Wow! What a nice bundle of fabric!!! I've no idea what I'd make but they sure are cute. Lovely selection! I really need to repair a bed sheet and fancy sewing on a few pretty hexies... these would look very pretty and springlike! I'd love to make a hexagon flower baby quilt! I just admire this bundle. I could not have put this together, EVER, and I love it. Thank you so much for this great giveaway! I would sew some mini quilts for my sewing room. Building my stash and this bundle would be a great addition! Into quilts mostly but how about a Weekender bag? Really pretty! I would make something for my girls because I know they would love those fabrics! Love the bundle. I'm doing some pillows for my sister's retro travel trailer. She'd love these prints. Pretty! I would make a quilt for my sister, or one of my nieces. A quilt for my mum! She loves 30's feedsack prints and I think the fabrics are perfect for her! Love your fabric choices - so springy! I'd love to make a doll quilt for my grand daughter, she would love a specail blanket for her Mini-gale doll! That is a beautiful bundle! I would make a scrappy nine patch lap quilt with it. Thanks! Now following on IG too! Oh, these are so pretty. I'd probably make a scrappy or off-set log cabin. Already follow your blog. I've been eyeballing some of these prints already for a baby quilt I'll be making soon! I would love this FQ set. I'm not on Instagram or Bloglovin but I follow you on Feedly! I think they would make a nice pillow. Incorporate it into a scrappy quilt for our home! Thanks for the chance! I would love to make a quilt to my little daughter. :) Thank you for the opportunity. I would make an owl baby quilt for an expectant young mom that I know. You done good with the bundle! ;) I have a couple quilts planned that I'm gathering fabric for. One is a 1930s grandmothers flower garden. Also, I added this giveaway to my link up at http://www.thegiveawayroundup.com/linkup. I would make a scrappy quilt. Love the fabrics! Thanks for the chance to win. Beautiful fabrics! I would love to make a string quilt for Spring! I would make a quilt that my neighborhood quilt group is making. The fun colors and prints would be perfect. I am following you, but I don't have instagram. It would be perfect for a baby girl quilt I need to make! I love your color choices, I would probably make a baby quilt for a future generation with these luscious colors. I plan on making a few baby quilts for my grandchildren to use when their kids arrive, that will be a wile down the road so I have some time to get these made. I would make a quilt...maybe half square rectangles or granny square or ??? So pretty! I am working on multiple projects for our Church fair in November. These would be very handy! I'm in the process of making stack and wack placemats, and I need a lot more fat quarters! Nice! That looks like a summery picnic quilt if I ever did see one. And if there's any fabric leftover, I'd definitely need to line a picnic basket with it to carry some yummy eats! Love the colours, the fabrics would look great in a child's quilt that I'm about to make for a friend's daughter. Following you on Instagram! (along with several of my friends I noticed). This is shouting Easter at me, so tea cosy, egg cosy, placemats, coaster etc for the Easter breakfast table. Lovely bundle. Think that bundle would make a cute flower garden quilt. I follow your IG feed and enjoy seeing your projects. I think I would make my little grandchild, Chloe Jane a cute little patchwork skirt with a matching headband! Spring is around the corner, so she will need some lighter clothes. I follow your blogspot via email. I really enjoy it too! They would make some lovely new pot holders for my kitchen. They would brighten it up tons. I see some cute little stuffed toys, and maybe some pretty pillow cases. Thanks for the opportunity to win! I have been wanting to make a triangle quilt. These fabrics would be perfect. I think your stack would make a delightful star or medallion quilt. Congrats! That's so fun! I'd make a spools mini quilt and a bionic gear bag. Gorgeous choice of fabrics! I would make something with curves and circles! I get your email updates! HI, LOVELY BUNDLE>LIKE TO WIN IT AND MAKE A NEW SPRING TIME QUILT! THANK YOU FOR SHARING! I would love to make some cute little dresses for my granddaughter, Nellie. There are adorable patterns using multiple fabrics. I would make a diamond grandmothers garden centre placemat for Easter. Such gorgeous spring time colours and prints. Follow your blog already. Those fabrics would make a really cheerful quilt or maybe a quilted pillow for a little girl's room. I would make a churn dash quilt. All the fabrics are beautiful. Love the fabrics you chose! A bag would be so cute in them. I've been following your blog. I would like to make a small wall quilt to brighten up my sewing corner. I'd actually like to make some pillow cases with these lovelies! I am following you on Blogloving as Rose Santuci-Sofranko. God bless! I would make a pouch. I love patchwork pouches with Japanese zippers! Oh my how lovely these are! I'm dying to make a cathedral window pillow and think this would be the perfect selection to do it! Ohhh I would love to make a big block quilt for my daughter! thanks! What a wonderful selection of fabrics! I love how you're able to grab faves from different collections and make your own special group! Love them! A beautiful collection of fabrics. I would make a lap quilt for spring! (Is it ever going to come?) I just put my name to follow you by email. Such cute fabrics! I'd love to make a baby quilt for my friend! I think they would be great in a flower appliqué quilt I am wanting to make. Thank you for a chance for these. I think they would be lovely in a pickle dish quilt. Lovely. I love the fabrics you picked for your bundle! I would use them to make some of the projects from the new Farm Girl Vintage book. I follow you blog via email. Thanks for the chance to win. I would love to get my hands on it and make a quilt for my newborn baby girl! I would make some of my Ticker Tape mug rugs - to keep and to give. I also follow you on Instagram. Thanks for hosting this give away. Your blogger selection is perfect. I love your selection of fabrics!! I think I would make a sew together bag, a pretty cover/ organizer for my sewing machine and if there was anything left a cute mug rug. I follow your blog and on Instagram. Thanks. I am a BL follower. I sort of see a Tumbler quilt made out of these or maybe a Drunkard's Path. Nice fabric choices. I follow you on Bloglovin and would use some in my Moda Building Block quilt using the pattern I bought from you. I think that these would make cute patchwork summer dresses for my two granddaughters. Lovely prints to make an EPP Sew Together Bag! Thank you for the giveaway. Following you on Instagram and via email. I would make a simple drawstring bag, newbie sewer!! So I just finished cutting out all my blocks for the circle game pattern by Jen Kingwell .... That is going to be some work! To give myself an easier project to switch off with, I'd love to do a medallion quilt with these fine fabrics. Love this palette! Your fabrics are beautiful. Already follow your blog and I'm off to follow your Instagram. What a gorgeous selection, they would make beautiful dresses for my bunnies! I've recently bought the Moda Building Blocks pattern (wink!) and I think these fabrics would make a lovely fresh version. Thanks. Hey, this is a great choice of fabrics. I planned to do a paper piecing project and I'd love to piece this nice fabrics together to get a super summer bag. I would add these fabrics to a scrappy trip around the world quilt I have planned. Thanks for a chance to win! I follow on bloglovin. I also follow on IG. That is such a great combination, Jessie!!!! If I were to be the winner of this lovely coordinated bundle, I´d just have to make a dresden quilt and some cushions to go with it. I am thinking possibly a purse or a wall hanging. Or BOTH! Thank you so much for this incredible giveaway! These fabrics are divine! If I was lucky enough to win I would like to try out the Dresden Quilt top - nothing like a challenge! I think these would make a darling set of mother daughter aprons! I'm always amazed at what one can make with Fat Quarters! I'd do something paper pieced and make a baby quilt ~ my daughter in law and son are having a baby girl and this fabric would be perfect! I follow you through email! Love this fabric. I have been making little zipper bags lately. This fabric would be great for them. I'd love to make a quilt with this darling bundle. I follow you through email. I don't know what I would make with the bundle until I have it in my hot little hands so that I can feel of the beautiful fabrics, but it would be something "Spring" like. Have a sweet new grand daughter coming to our family in August... pretty baby quilt for a precious long awaited baby. Such pretty fabrics…I'd make some fun totes and buckets with them to give as gifts. Thanks for the sweet giveaway! New follower on bloglovin'. I would make a scrappy quilt out of them. I'm a follower now! I love the assortment of fabrics you choose! They would make a good sampler quilt! Beautiful bundle. I'd make a baby quilt with those fabrics. Thanks for the chance to win! Some fun pillows and/or table topper would look cute. I would like to make a quilt for my sister from these lovely fabrics. I would do some mini quilts or a wall hanging. I love the fabric. They are yummiest and if I win I'd love to make a log cabin quilt for me.Thanks for the fun! i am making a bitty blocks quilt! Love the colors in your fabric bundle. I would likely use them to make a lap quilt for my niece; and use scraps in my postage stamp quilt. Thanks for the chance! I'd make a quilt for my newest grandchild due in early August! Yummy fabrics! And I just started following you on Instagram. Thanks for the drawing! I love this!! I'd make several coordinating pouches so everyone could see these lovely fabrics. This fun bundle would go perfect with the fabric I am using for a quilt for my daughter. I would love to make the addition to what I have. I also follow you via Bloglovin. I just got a new overlocker, which I'm so excited about, and it needs a pretty cover! Beautiful bundle!! You have a real talent at fabric picking!! I would love to make a coordinating kitchen set - placemats, tea towels and tabel runner to make my boring kitchen feel like happy spring! I'd love to make a tote or some pillows with these fabrics! what a lovely bundle, I like to make an Irish chain block if I win this. I follow you blog on Blogovin. If I win I´d love to make a baby quilt. Thanks for the chance!!! I love this! Oh, what a great bundle. I'll make a lap quilt for myself if I win. I would like to make a sweet picnic blanket with these fabrics.